Start Your Free Estimate Now! Our team answers homeowner questions every weekend on WCCO 830 AM from 9:00 am-10:00 am. Have your most pressing home improvement questions answered by calling 651-989-9226 or texting 81807. Here’s the must-know information our COO, Andy Lindus, shared on 6.23.18. The quickest way to change the appearance of your home’s exterior is with siding installation. While we install many types of seamless siding, the most sought-after material is LP® SmartSide®. With plants in Two Harbors, MN and Tomahawk, WI, homeowners appreciate that they’re working with a local manufacturer. To ensure the siding looks its best we, have it finished with Diamond Kote® in Wausau, WI. While other finishes are available, Diamond Kote® comes with a significantly shinier finish. The material is resistant to scratching and is accompanied with a 35-year, non-prorated finish warranty. While it has the aesthetics of cedar siding, it’s easier to install because it’s uniformly made. There’s also no worry of insect infestation that can attract woodpeckers. Unlike fiber cement products, there’s no need for installers to wear respirators or use expensive specialty blades. While our company offers both asphalt and metal roofs, the overwhelming majority of homeowners opt for asphalt roofs. We rank as only one of 10 contractors in the country to have received the GAF Triple Star President’s Club award. One of the biggest reasons we decided to partner with this asphalt roofing manufacturer is their commitment to technological advancements, including a 20-year algae warranty. In addition, they take care to design shingles that come in array of unique shapes, thicknesses, and colors. Product lines our client base gravitates to include Grand Sequoia®, Glenwood®, and Grand Canyon®. Many times, homeowners are unsure of whether their roof has reached the end of its lifespan. While there are many signs, one of the easiest to spot it granule loss. While you may notice a small amount after the installation of a new roof, continuing to see granules in your gutters or landscaping may mean that the roof experienced hail damage. When hail comes in contact with shingles, it can have a sandblast-like effect on the granules. 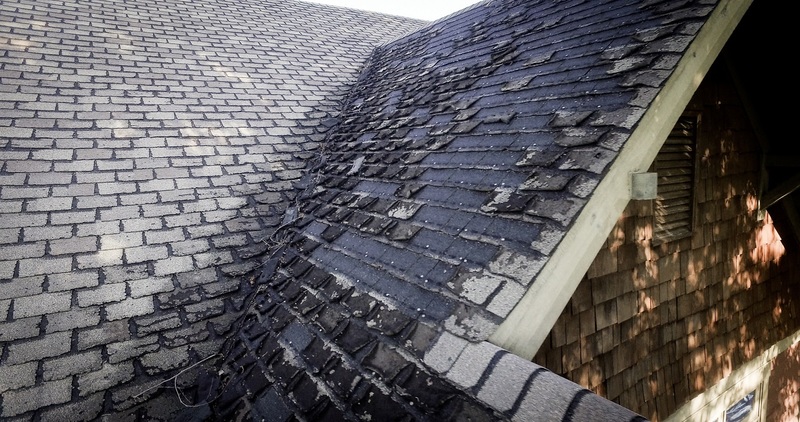 Losing a significant portion of your roof’s granules compromises their ability to protect the asphalt within the shingles by deflecting UV rays. When this happens, it’s only a matter of time before shingles begin to crack and curl. In order to ensure your roofing contractor is reputable, we suggest verifying their rating with the Better Business Bureau and Angie’s List. The benefit of conducting research on these websites is that contractors cannot pay their way to a better rating. Friends and family members also can share their personal experiences with contractors. We recommend getting three estimates and be sure to ask prodding questions to the references your roofer provides. This St. Paul homeowner wanted materials for his home renovation that were maintenance-free, energy efficient, and eye pleasing. Check out the solutions we proposed! Dan & Cynthia reached out to us because their home’s original siding, windows, and gutters needed revamping. With careful consideration for their home’s curb appeal, they opted to work with our designer to put together a cohesive look. This home was less than a decade old when it required storm damage restoration. Learn how we restored it to its original beauty! "This was a big job. Once they started, it all moved very quickly. They had to do some extra work because of water damage discovered when they removed the old siding, but the charge for repairs was lower than expected." - Barbara K.
"You folks do great work!" - Dan O. "Lindus Construction has completed two successful projects on my home in the past three years. Everything on these projects was performed with skill, thoughtfulness, and in a timely manner. The staff at all levels provided excellent service and workmanship. I have recommended this firm to my friends and colleagues." - Alice M.
"Thank you for such a professional way everything has been handled. I can't say enough good things about your crew." - Ron C.
"The work was well done. The roof went very quickly and clean-up was good." - Theresa W.
"Lindus Construction was very prompt and efficient in the re-roofing of our home following a 2017 hail storm. Their installation of LeafGuard® Gutters was superb." - Vicki B. © 2019 Lindus Construction. All Rights Reserved. Start Your Free Estimate Today! To receive a free in-home no obligation estimate fill out the form below or call (651) 212-4221.